A bomb attack on a tourist bus in the Sinai peninsula has killed three South Koreans and an Egyptian, officials say. Fourteen South Koreans were also hurt in the attack, which came as the bus was preparing to cross into Israel. A device was detonated either inside or close to the bus, but exact details are not clear. No-one has admitted carrying out the attack. The Sinai peninsula has become increasingly lawless since President Hosni Mubarak was overthrown in 2011. The bus was reported to be heading into Israel from St Catherine's monastery, a popular tourist destination near Mount Sinai, when it was attacked on Sunday. South Korea's foreign ministry said on Monday that the bus was carrying 31 tourists, plus three tour guides - two Korean and one Egyptian. Those who died were the two South Korean tour guides and another South Korean tourist, and the Egyptian driver, Yonhap news agency reported, citing the ministry. Fourteen other South Koreans were taken to hospital. The passengers were members of a church group on a 12-day tour of religious sites in Turkey, Egypt and Israel, the South Korean news agency said. The exact cause of the blast is not clear. One report describes a young man throwing a device into the vehicle, another - citing South Korea's ambassador to Egypt - says the man boarded the bus. 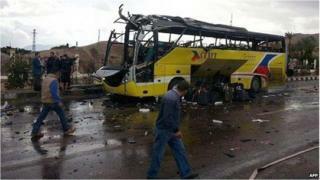 "We strongly condemned the terror attack against the tour bus... It is beyond deplorable," South Korean foreign ministry official Cho Tai-young said in a statement. South Korea would "actively co-operate" with the Egyptian government to find out who carried out the attack, he said. The frontier was closed after the attack. Egypt's struggling tourist trade - which is a slim lifeline for the economy - looks set to be another casualty of the bombing, says the BBC's Orla Guerin in Cairo. Tourism Minister Hisham Zaazou said he was "very disappointed" by the attack and hoped it was an isolated incident that would not be repeated. A number of militant groups operate in Sinai, and Bedouin tribes live largely outside of the control of Cairo. Attacks by Islamist militants have intensified since the army overthrew President Mohammed Morsi in July. Our correspondent says the bombing could signal a shift in strategy by al-Qaeda-inspired militants in Sinai, from attacks on the police and army, to softer targets. Mr Morsi appeared in court on Sunday to face charges of espionage and conspiring to commit acts of terror. The Islamist former leader is facing four separate trials, three of which have opened so far.